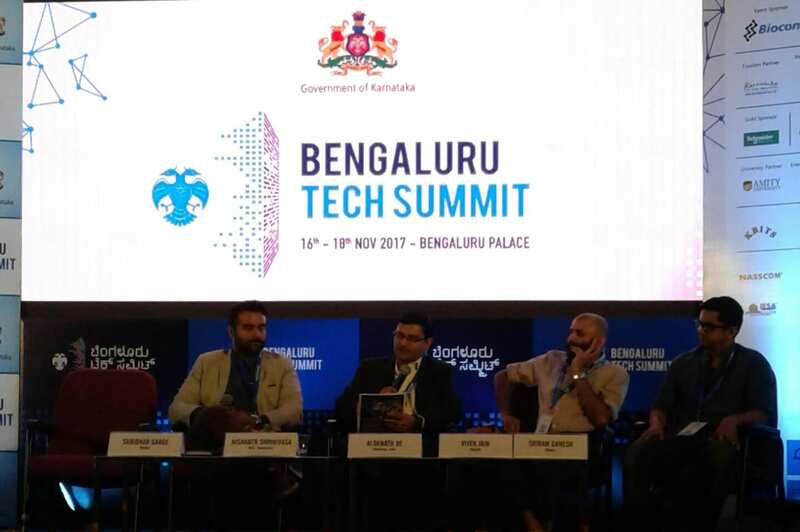 The 20th edition of the Bengaluru Tech summit organised by the department of IT & BT, Government of Karnataka at Bangalore, covers all the aspects of currently emerging and trending technology. 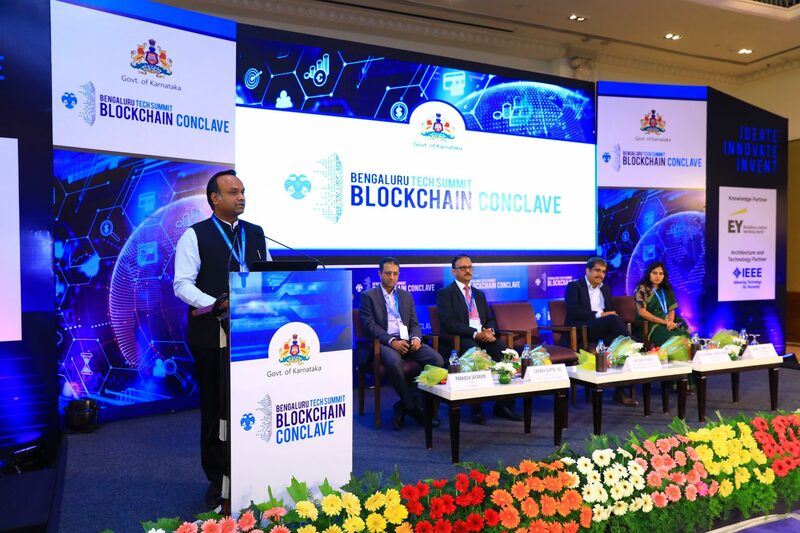 One such technology is Blockchain, and to present the views of trends, security and adoption were the evangelists from the industry who have been instrumental in shaping it up the way it has in India. 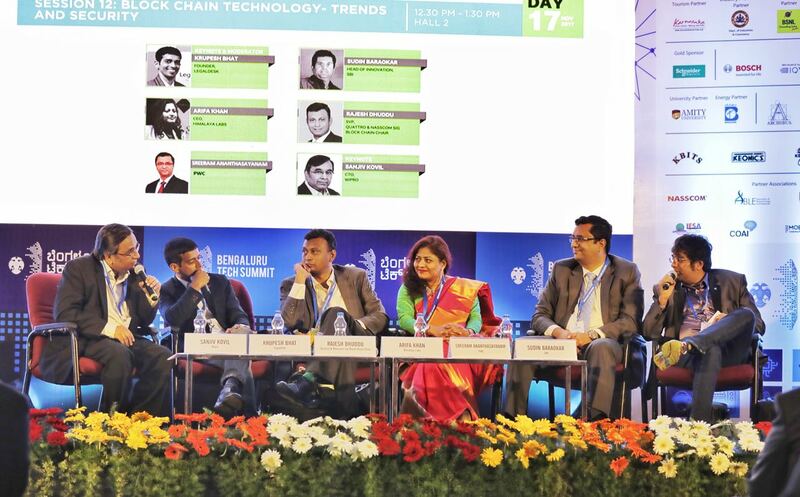 “Technology has been evolving over the years and if someone would have talked about blockchain five years ago, it wouldn’t have made much sync with the people”, shared Sanjiv Kovil, CTO, Wipro, who was moderating the talk on blockchain. He said that the acceleration has been phenomenal for the blockchain technology and it has proven to be one of the most disruptive technologies of the decade. The concepts of decentralized approach, smart contracts, crypto currency which would have sounded vague till few years ago, has been now resonating with the tech freaks. Arifa Khan, CEO, Himalaya Labs, who has also been India Partner of Ethereum said that only it was only in the beginning of 2017 that blockchain became mainstream. The countries are still adopting the technology into their core competencies and has replaced the traditional way of working in many ways. Kovil shared that the reason behind blockchain witnessing a huge popularity is the fact that it has been able to streamline the processes along with offering other advantages such as cost benefits, high quality user experience and improving the overall efficiency. Kovil believes that its rampant acceleration will lead to disruption across many markets including energy, telecom and others. All sorts of evolving technologies like AI and IoT are getting into blockchain and lots of investments are coming. Arifa added that blockchain is continually being developed by developers all over the world and distributed cloud storage and distributed computing for complex mathematics are the key components to blockchain. “Developments such as lighting protocol, tangle protocol, and others will go a long way in keeping blockchains safe”, she said. 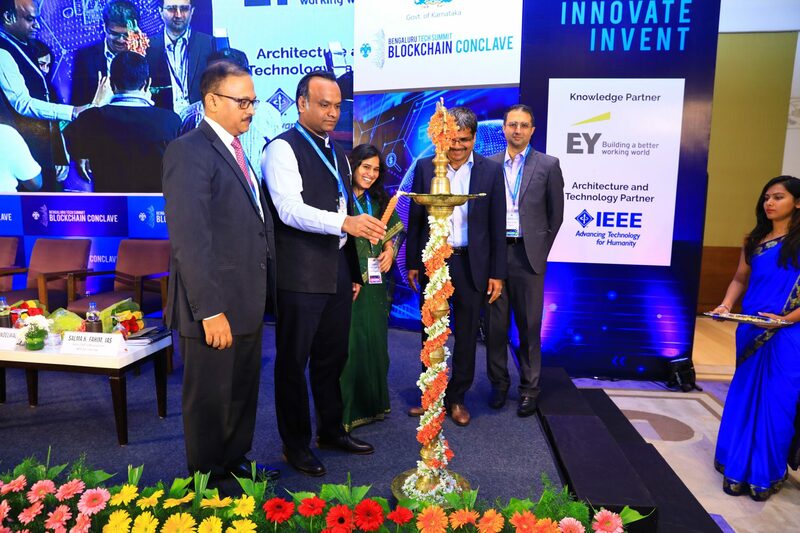 Sreeram Ananthasayanam, Partner, Government and Public Services at PwC India said that there is a lot of hope around blockchain and it can change our lives in many ways. “By 2025, 10% of the GDP will be built on blockchain, and the scale is unimaginable”. It can increase supply efficiency that is one of the major reasons for a loss in GDP. Adopting blockchain in these three areas of self serving identity, registries and proof of ownership can do wonders for the country, and there are a lot of initiatives being taken up by central and state government. Two of the most popular tools around blockchain have been the smart contracts and cryptocurrency. “The concept of smart contracts was introduced as early as 1970, but has become more relevant only today”, said Khan. These are nothing but self-executing contracts with the terms of agreement between the buyer and seller being directly written into lines of code. It can exist across a decentralised blockchain network. It can be translated to machines for performance verification to ensure there is no error on either side. The only vulnerabilities are at the program level. Cryptocurrency, a digital asset designed to work as a medium of exchange, has been built on the no-trust basis. It depends completely on cryptography to ensure secure transactions between the parties who are totally unknown to each other. If cryptocurrency is kept aside, blockchain can benefit in following areas—fintech, energy, cybersecurity and the government. Though it has been creating business opportunities, the technology is not averse to challenges. There is a thin line between transparency and privacy, which needs to be addressed. There are other non technical challenges in terms of the overall adoption of the technology and defining ROI. “There is uncertainty in protocol”, said Rajesh Dhuddu, SVP, Quattro. Largest adoption is in public places like cryptocurrencies, cloud storage and AI, but there are vulnerabilities from a protocol adoption perspective. The other challenge is that it has not been implemented widely, and night take few years before it runs full fledged. Krupesh Bhat, Founder, LegalDesk echoes the fact that the biggest challenge in India is its adoption. “There are technologies like e-signing but still it is not applied for cases such as rental agreements, there is the technology but no adoption”. While the speakers believed that blockchain is set to bring organization efficiency, they also agree to that fact that they have to still develop a proof of concept to witness larger adoption and build more infrastructure for blockchain so that common public is benefitted from it. When And How Can Virtual And Augmented Reality Become Part Of Our Daily Lives?